1. Technology will continue to evolve. Flexible electronics are often used in applications where rigid components limit the serviceability of traditional electronic components. Through a process called fabrication, flexible plastic is used as a substrate for electronic components derived from active and passive polymeric materials. Unlike conventional approaches for manufacturing silicon transistors on glass for displays, today’s technology combines high-performance active, organic thin-film transistors (OTFTs) with passive elements. This allows an electronic device to bend, wrap and conform to a desired shape during use—revolutionizing the way we make and use technology. Take the automotive industry, for instance. Mechanical dashboards have been replaced with flexible displays to provide drivers and passengers with useful information. 2. Consumer demand will drive innovation in new markets. 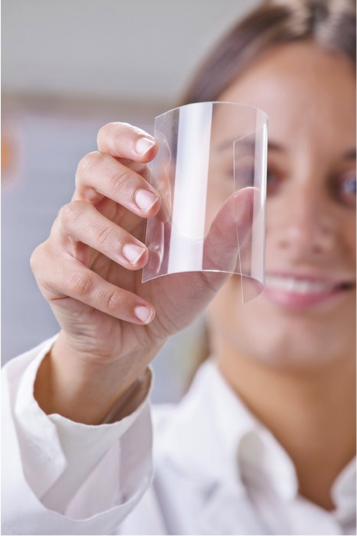 The flexible electronics industry is characterized by an intensifying demand for devices that are smaller, lighter and thinner. Fortunately for consumers, the potential for research and development is virtually limitless thanks to the ingenuity of and the myriad transformations available to chemists. As flexible sensors and systems become more mainstream, the market is set to witness exponential growth in consumer electronics and beyond. In fact, Markets and Markets projects the flexible electronics industry to grow from $23.92 billion in 2018 to $40.37 billion by 2023. From military to medical use, flexible electronics are now finding opportunities in more commercial and industrial areas. 3. The Internet of Things (IoT) will continue to change our everyday lives. Flexible electronics are considered to be the technological basis of IoT. Think wearables, for example. While you walk, run and bike around, the sensors and displays built into these technologies connect you and your fitness data to the digital world. With the sheer amount of data collected, consumers are able to stay connected anytime, anywhere—thanks to flexible electronics. Not only will this change the way we make and use technology; it will completely transform our lives. Promerus manufactures a variety of electronic materials for the next generation of applications in markets such as semiconductor, optoelectronic and electronic packaging. These materials are can be used as dielectrics, adhesives, space-fillers in flexible electronics. For more information, take a look at our materials and applications to see what Promerus can do for you.